You won't find the huge resorts of other Caribbean destinations in Bocas del Toro, Panama... just an easygoing, water-lover's paradise, where snorkeling, island-hopping, and beach-combing are the order of the day. This is the Caribbean as it should be -- clean, white-sand beaches; the freshest fruits and seafood; colorful wildlife; and smiling, laid-back locals. Plus, this province on Panama's northern Caribbean coast is easy to reach. Its jumbled and enchanting archipelago is just an hour's flight-time from Panama City and around $230 round trip. Whatever brings you to Panama, whether you're vacationing or exploring retirement hot-spots like Boquete, Coronado, or Panama City, devote at least 48 hours to these wave-lapped islands. Here's how to make the most of your visit. You'll arrive in Bocas Town, on the main island of Isla Colón. 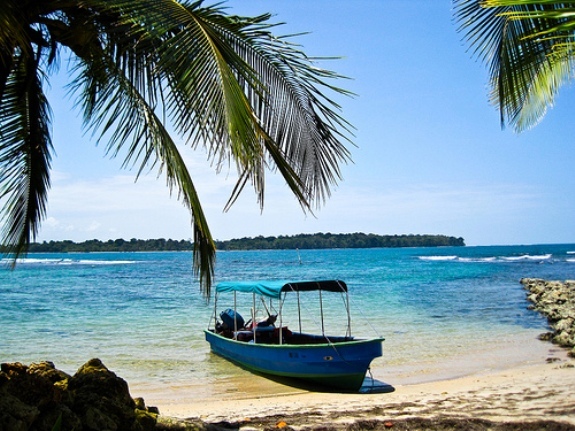 Originally developed in the early 1900s as a banana plantation, Isla Colón remains the most developed of the 270-odd islands off the Bocas del Toro mainland. Christopher Columbus happened upon the area in 1502. It's said he repaired his ships on Isla Carenero, an island just minutes by boat from Isla Colón. Columbus overlooked its charms, though; the island remained vacant until it became a hub for pirates in the 17th century. Dive into the warm Caribbean waters. These impossibly clear waters aren't just made for swimming. All over Isla Colón, tour companies offer the chance to get up close and personal with the marine life. Starfish, iridescent parrotfish, sponges, and dozens of types of coral are on view. There are plenty of prime snorkeling spots. Tour companies usually take you to a combination of the best (such as Crawl Cay, Admiral Bay, Zapatilla, and Hospital Point). Expect to pay $20 to $30 for a full-day tour. Or pack more than just snorkeling into your day-trip. Jampan Tours (located less than a minute from Hotel Bocas del Toro, in the center of town) will take you snorkeling and then bring you to Dolphin Bay. Named for its residents--who breed here--it's the best place to catch sight of Flipper and friends frolicking around your boat. Then it's on to see some landlubbers...at Nancy's Cay, a mile east of Isla Colón, you'll see sloths and other jungle creatures. Total cost: just $25. See here for more information. Head to the botanical gardens at Finca Los Monos (the Monkey Farm) to take in more wildlife. These gardens, five minutes from the center of Bocas town, are the brainchild of nature-loving expat Lin Gillingham. After purchasing a 32-acre lot on Isla Colón in 1998, Lin and her husband David spent two weeks hacking paths through the jungle. They then set about creating their visionary garden, which now hosts vividly-colorful tropical plants, fruits, and trees. Butterflies, hummingbirds, parrots, sloths, howler monkeys, and other creatures now also call this home. Don't miss your chance to see a nesting turtle. Take a 30-minute taxi ride at about 7 p.m. to Playa Bluff ($15 each way) and stop at Playa Bluff Lounge. Tell the staff you want to see the turtles--they'll let you know when a guide has spotted one for you to see. While you wait, have a drink or dinner (I had catch-of-the-day red snapper, fries, salad, and a coffee for less than $15). But be prepared to leave when the guides telephone the restaurant. The trek up the beach is by starlight, but that's not the only light you'll see. Underfoot, we mistook the sparking red light for fireflies, but our guide attributed the phenomenon to new sand and coral. We found our leatherback just as she finished laying her eggs. For the next hour we watched her bury and camouflage them with her powerful flippers before she returned to the sea. Four species of turtles are known to nest on Bocas del Toro: the leatherback, the hawksbill turtle, the loggerhead and the green turtle. Nesting season usually begins in March and ends in September. Hatching season starts in May and ends in November. Local guides charge $15 per person. Spend your second day relaxing. Work out the kinks with a massage at the Lil' Spa Shop by the Sea (about a 15-minute walk from the town center). Choose from a head, neck, and shoulder massage, a hot stone massage, or go the whole hog and have a 90-minute "Ultimate Escape" massage. Visit their website here. And ask for a gourmet popsicle while you're here. Made with fresh island ingredients, the choice range includes passion fruit, organic chocolate-coconut, creamy ginger, and key lime. Cost: $2. Head to Red Frog Beach on Isla Bastimentos. A 15-minute water-taxi ride will bring you to a wooden walkway through jungle growth. You can walk to the beach from here in 10 minutes...but you'll be rewarded for taking your time. Tropical birds and wildlife lie behind the coconut trees--at a little lagoon halfway to the beach, I saw a family of six tiny crocodiles (the length of my forearm). Spend the day here relaxing with a cocktail or a good book. No need to pack lunch. An empanada and cold soda is just $2.50 in the beach bar at the entrance to the beach; a hot dog and soda will set you back $8 at Punta Lava beach bar at the opposite end. Indulge in some seafood. You won't find fresher seafood than what's on offer on Isla Colón. Sitting on a wooden deck overlooking the water my first night, I tucked into the seafood rice in the Hotel Bocas del Toro restaurant. This $15 dish includes masses of spiced rice, octopus rings, flounder, shrimp, and prawns--almost too much for one person to eat. If you like your seafood a little less cooked, head to Raw Sushi and Martini Bar on Isla Colón's Main Street. Here you can pick up a red-snapper ceviche for $7.50 or salmon avocado rolls for $8.50. Turtles aren't all that come out at night in Bocas -- party animals do, too. 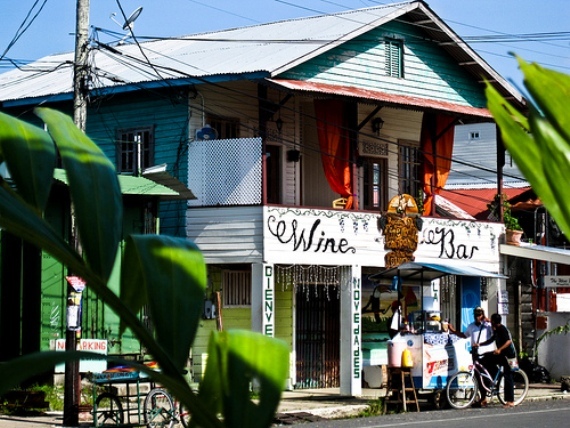 Known for its raucous nightlife, Bocas has something to suit everyone. Happy hours are common -- beers can be picked up for 50 cents, mixed drinks for $1.50. Though each bar has different times for happy hour, you're guaranteed to find one between 5 p.m. and 9 p.m. on on Isla Colón. • There are only two ATMs on Isla Colón at the island's single bank, Banco Nacional de Panamá, and many of the island's restaurants and stores do not take credit cards. Make sure to bring enough spending cash with you--or at least have a debit card on hand. • When traveling by cab, don't be surprised if your driver stops to pick up other passengers. Taxis here operate more like buses and can be flagged until all seats are full. This is a great way to interact with locals and meet other vacationers. • Embrace the relaxed manner of the island. Don't expect everything to happen immediately...but expect to encounter friendly service and broad smiles. A flexible attitude will be reciprocated--as I discovered when I forgot to bring cash to a local eatery. I was allowed to order and pay later. • Make friends with the locals and they will go out of their way to help you. They'll tell you where to find the best spots for everything...happily talk about the history of their island... and, if you split your fresh-baked coconut bread with them (50 cents from a seller on Isla Bastimentos), they'll show you a tiny mangrove island surrounded by coral and starfish, as Salsa, my water-taxi driver did, on a trip back from Red Frog Beach. • If you plan to see the turtles on the island, remember that photography is not allowed. The flash from a camera can disorient a turtle and prevent it from reaching water. Note, too, that seeing a turtle can be luck-of-the-draw--turtles can come to shore anytime between 9 p.m. and 3 a.m. Allocate a cut-off time for waiting to see one and stick to it.